After work we used to pop into Mum on the way home for a chat. However over the last few years Mum has become more frail. 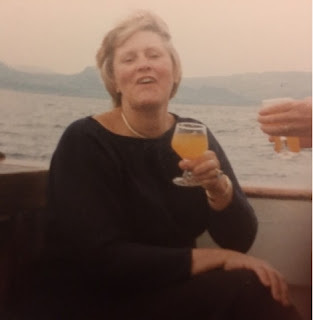 Mum began to fall and lost the ability to write, or remember a PIN number for bank cards but was keen to live in her home she had shared with dad and all it's memories. One day I found Mum lying on the floor, her arm had caught on the bed support that helps you get out of bed and was badly damaged. She had a urine infection which probably contributed to the fall and which then lead to delirium. The effects were devastating and changed not just Mums life but ours too. She spent the next four months recovering in hospital but never back to where she had been, no longer able to walk or even stand and with the dementia now advanced so she was not able to live on her own. Difficult conversations with medical staff about not resuscitating were had, and luckily we knew Mums wishes but it is still hard to have that conversation. Early on we decided to try and bring Mum home to live with us. My husband was the first to say look let's do this, he grew up with grandparents living in the family home so that wasn't an issue and without his full support it would have been too hard. Mum is now extremely frail with advanced dementia and we had a conversation with her General Practitioner to share mum’s wishes for the future. The anticipatory care plan has to be shared with the health care professionals, out of hours, ambulance, carers etc. This is enabling us to care forMum at home and to make her end of life care asdignified as can be amongst her family in a home environment. Fortunately we had a spare room but it wasn't entirely suitable and the occupational therapist was invaluable in arranging equipment to make the room work. Lots of factors are involved when bringing a relative to live with you. We have a care package to help us: 4 times a day with 2 carers. We just could not manage to continue to work and care for Mum without reliable care. My advice to anyone in similar situations is try and get as organised as you can. Simple things, think it all out like who is collecting medication etc. Friends have said they could not manage such intrusion into their home but our view is that it is a very minor inconvenience and you have to cross that bridge if it happens. You don't always know your strength and this is our family. The day starts early giving Mum breakfast before the carers come for their first visit, keeping up to date with laundry, all before heading out to work. Practical stuff. It is important to keep on top of supplies that mum needs ranging from disposable napkins to specific food that Mum can swallow. Our kids are away from home but are back regularly and we have encouraged them to still have friends to stay, everyone pops their heads round the door to say hello and a wee chat. Occasionally we see glimpses of the Mum we remember but this is happening less and less and now we are really looking for the good moments. Dad and Mum were married for over 50 years, they met when Mum was 15 and started dating when 18 years. They had a lifetime of memories but she seems to have lost them now and never mentions him and doesn't recognise photos of him anymore. Hallucinations are common and are difficult for us all as they trouble her greatly but seem to occur less often now she is at home. Mum adores our dog and she pets her when she becomes anxious. Mum will often be forthright in her views on a matter to us but never has anything but kindness to the dog. We don't know the future. It could be that we are not always able to care for Mum at home as a result of our own health etc and at some point we may need to look at a nursing home for Mum and I think anyone who cares for someone at home knows this is always a possibility. Mums’ General Practitioner is great and the district nurses are supportive when we need their services.There are situations where pain has become an issue and a nurse from the palliative care team has become involved to help us understand how we know when someone with dementia is in pain. It's hard to read Mum for symptoms as someone with dementia loosesthe ability to articulate how they feel. You just can't assume if they appear well that they are not in pain. There are some subtle changes with Mum now more confused and anxious. It's hard to recognise them and you need to know that person very well. Would we recognise delirium again? I can't say with confidence we will but we are aware that Mum is at increased risk of it occurring again. 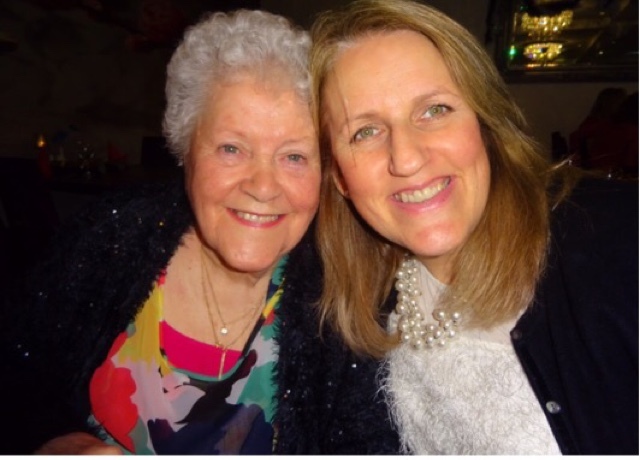 The benefits to having Mum living with us may not be shared by everybody and it may be hard looking at us to understand but there is huge comfort having Mum live with us; it's right for our family. The challenges are greater than anything we have ever undertaken. Watching someone you love fade away was always going to be difficult, we might have run marathons in the past and climbed multiple Munro’s but being a daughter and a carer in these circumstances is something much bigger on a 24/7 basis especially when you open your eye's . I love this picture of Mum she would be on her friends boat who did fishing on her way to Tiree to help with the harvest of other friends. Betty loved doing that in her hols.